Must try Creamy Sesame Noodles with Peanut-y Sesame Sauce! 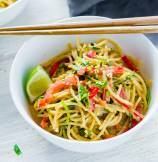 Creamy, sweet and spicy Sesame Noodles with outrageous delicious peanut-y Sesame Sauce. Pack these noodles to go or serve on side with BBQ... These Cold Sesame Noodles fit perfectly in every role. (even great to pack for lunch). Don't consider these any peanut sauce noodles because Sesame Noodles are way more than that. It has best of both words. Peanut butter and Sesame Paste. The distinct sesame flavor is what sets this recipe apart from rest. I believe, every peanut butter lovers needs to this recipe in their repertoire. It is so easy to put together, and travels well. This recipe combines peanut butter with nutty sesame paste. When I shared Tahini Sauce a few days ago, I realized, you guys need to try my Sesame Noodles Recipe. Speaking of noodles, the best noodles to go with Sesame Sauce are Udon. The texture of udon noodles holds on to sauce very well. I used a wheat-free dried noodles variety for these pictures. I recommend trying fresh udon noodles for best result. I lightened-up noodles by replacing half of noodles with veggies. 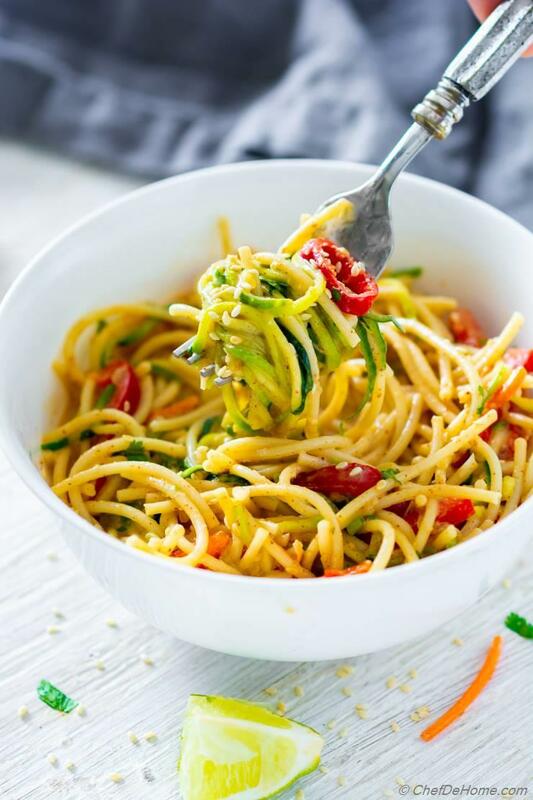 A full spiralized zucchini, bell pepper, and carrot strings. 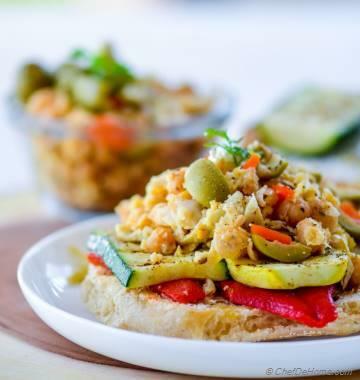 This is a good trick to serve pickiest eater few serving of veggies. Honestly, no one says "no" to delicious and creamy Sesame Sauce. 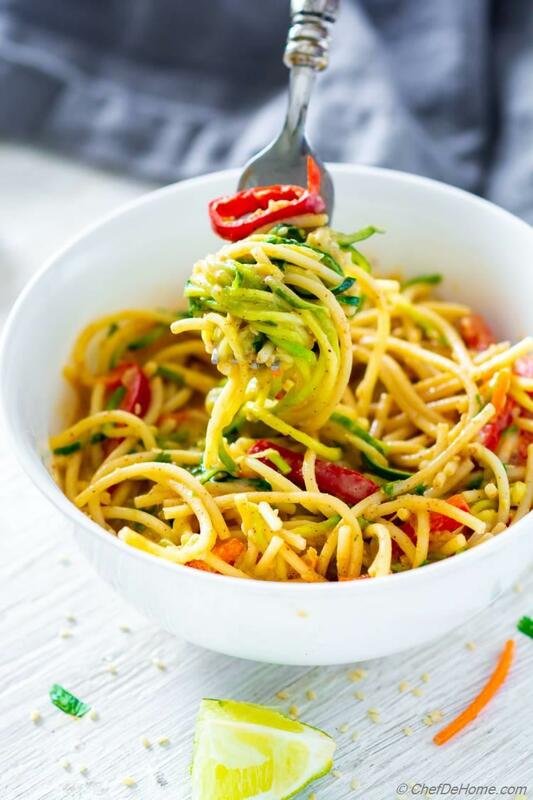 Plus zoodles blend so well with regular noodles, it is hard to resist bowl even with veggies. 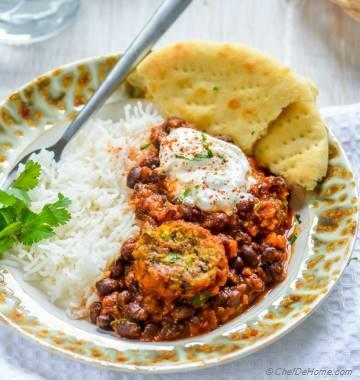 All ingredients for this recipe are easy to find. If you love Asian flavors, most of these will be in your pantry. Sesame Paste is also known as Tahini Paste. You can find Sesame Paste in Mediterranean as well Asian Food Stores. The Asian Sesame Paste is slightly different in flavor from Mediterranean Tahini Paste. But addition of peanut butter, sesame oil and soy sauce make up for the flavor difference. What I'm saying is, even if you have Tahini Paste at home, you can still try this recipe. You can also find Sesame paste in International Food isle of most US Stores. Shout-out for few of your favorite Peanut Butter-y Recipes on Blog. 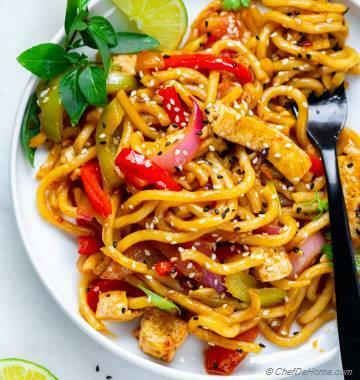 If you hitting beach or in mood of weekend BBQ, don't forget to pack some Sesame Noodles. I hope you will love'em as much as we do. Total Time 30 minutes Prep Time 20 minutes Cook Time 10 minutes Difficulty Easy Yields 3 Servings Serves 3 Notes No. of servings depends on serving size. 1. Cook udon noodles according to package directions. 3. 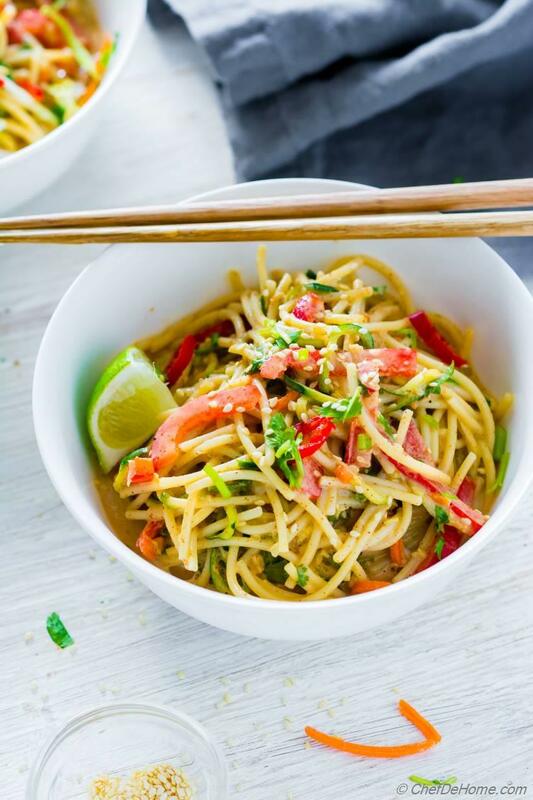 In a wide bowl with sesame sauce, add cooked and drained noodles, *spiralized zucchini (if using), other veggies such as carrot, bell pepper with chopped cilantro. Toss to coat noodles in the sauce fully. Ladle to bowls, top with toasted sesame seeds. Serve lime wedges on side. Enjoy! Zucchini Noodles are optional. You can totally skip or make a Sesame Noodles only with Zucchini Noodles. If using, for best results, saute noodles in saute pan with a tsp oil for 2 minutes before adding to sauce. This helps get rid of extra water of zucchini.